Located on Bridge Street Di Rita’s is a family run Italian restaurant that produces the finest authentic Italian cuisine. Owner Andrew Di Rita who was excited at the prospect of fulfilling his dreams by owning his own restaurant and turning Di Rita’s into the best place to eat in town. Andrew explained “Being Italian I have always had a love for food and as a young boy I worked in my father’s Italian restaurant. As soon as I stepped foot into the restaurant I developed a strong passion and this was mainly due to other people’s delight at enjoying our food”. Andrew’s father has been an established chef in St Ives at the Molise restaurant for over 27 years and people have travelled from afar for his food which is especially well known in the area. Andrew went on to say “My father left the Molise in 2016 to come and work with me to establish a family run restaurant. 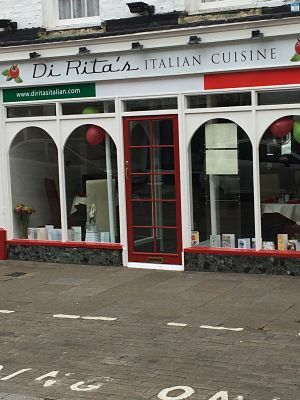 I have always had a dream of owning my own restaurant one day so I can give a unique service to customers which thrives on passion and great Italian food .We are now delighted to open Di Rita’s to all our customers who have remained loyal to us throughout the years and I also very much look forward to meeting new customers and introducing them to our authentic Italian cuisine experience.